Foundation - LifeLink Foundation, Inc.
More than 30 years ago, a small group of innovators, led by renowned nephrologist Dr. Dana Shires, made a commitment to save lives through organ and tissue donation and LifeLink Foundation was born. What was once a small non-profit organization with big dreams but only a few employees is now a much larger organization – with more than 500 full and part time staff in west central Florida, Georgia, and Puerto Rico – who fulfills the life-saving dreams of waiting transplant recipients through the generosity of organ and tissue donors. LifeLink Foundation is made up of five divisions: LifeLink of Florida, LifeLink of Georgia, LifeLink of Puerto Rico, LifeLink Transplantation Immunology Laboratory and LifeLink Tissue Bank. LifeLink Tissue Bank provides lifesaving and life-enhancing tissue allografts to patients in need. 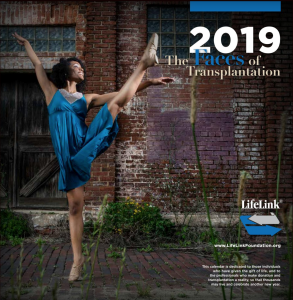 The LifeLink Foundation annual report, with highlights from July 1, 2017 through June 30, 2018, and “Faces of Transplantation” calendar, featuring stories of individuals and families impacted by organ and tissue donation. This publication is available in both English and Spanish. Preview Spanish version of the 2019 “Faces of Transplantation” Calendar & Annual Report here. Mr. Harold W. Mullis, Jr.
Luis A. Morales Otero, M.D. Ms. Brandi Quinn, MAcc, C.P.A.